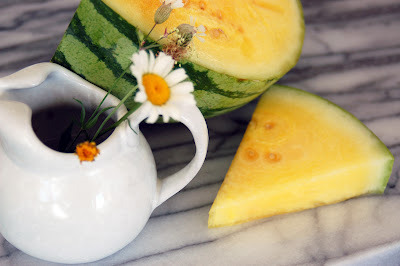 Yellow watermelon. Verdict? Not as sweet or full of flavor as regular watermelon; it tastes a bit like a cross between cucumber and watermelon, in my opinion. But it looks pretty with wildflowers. We are enjoying ourselves during our time away. My Mom stopped by for a couple of days, and Todd's parents will be with us this week. We're hoping that Todd will join us after a week in Tokyo. By the way, does anyone have any suggestions for a crafty/fabric shop where I should send him while he's there? He won't have much time, but I might be able to convince him to make one stop for me. 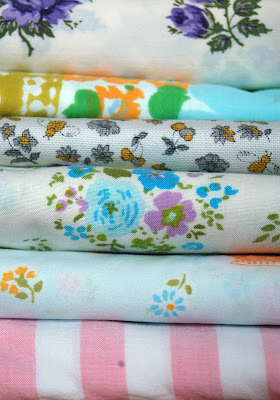 And I promised you a report on thrifting: so far we've found some terrific 60's and 70's printed sheets, some that remind me of the ones Alicia used in her vintage sheet bookbags, but not much in the way of fabric. I think I'll hit some garage sales next weekend, and maybe the local antique shops. I think maybe next week I'll send you some photo postcards. See you soon! Depending on where your husband is in Tokyo, I would highly recommend a trip to the Nippori area of the city, which is their Textile Town. Tomato is a particularly great shop and has great prices. I was there in early May and picked up some fabric, though I'm already wishing I would have picked up another suitcase full! I have some photos on my blog and please feel free to email me if you need more specific directions to Tomato or Nippori. Oh god, I'm the same with the iron. Mine is set up right next to me and I'm going to iron some fabric in a minute, but no way will you catch me ironing my shirts or pants or skirts. I think I like your dress better anyway, iron or no. I agree with Megan. Nippori is the best and Tomato is great as well. has some great places listed. Pretty good directions as well. tell him to pick you up a gocco printer. so easy and fun! look at the save gocco blog to see what I mean! If it were you going to Tokyo, I would say go for Nippori. But if it is your husband, Nippori can seem quite out of the way from where he might be staying. Definitely awesome, but might be almost too much of a good thing. May I recommend Okadaya in Shinjuku, or Yuzawaya (various locations)? As Jennifer said... Okadaya in Shinjuku. Best for a husband (with not too much time). They have everything. rummage sales tend to have hidden gems as well. enjoy your respite in the midwestern countryside! If time is limited, the shop at Shibuya crossing is the most central, and has a great range of cotton prints in the basement. Books 1st in Shibuya (just up the road) has a great selection of craft books in their basement too. Love the sheets you picked up! Lovely finds! Looks like you are having a good, relaxing time. I love your blog and all the fun things you have going on. So inspiring! i sincerely prefer your dress. the color and fabric choices and the cute sleeves especially. non-ironing gives it a special 'crispy' and natural touch. I like your dress better, too!! From your pictures I'd say you are in Northern Michigan, and there is a great fabric store in Traverse City called Fine Fabrics. (It's on 8th Street.) If you are a little further south there are the Field's Fabrics stores in Spring Lake, Holland, Grand Rapids, and Kalamazoo. In the Lansing area (Williamston) you will find gorgeous fabric at The Fabric Gallery and in the Greater Detroit area (Royal Oak) Haberman's is the place to go. I can't go to any of these stores without buying something, even if it is just a gorgeous button or trim. Enjoy your vacation in Michigan, I'm biased, but you can't find a prettier place to get away from it all.